In such a competitive scenario how can we make ourselves found and thrive as a business? Furthermore, have we thought about exploiting the online channel of sales? Can someone explain how to increase sales online? Answer to this question is yes and this post typically explains you this process. The current era is one in which the customer has significant choices about buying any product in any industry, costs are increasing and margins are decreasing, hence there is ever increasing competition. 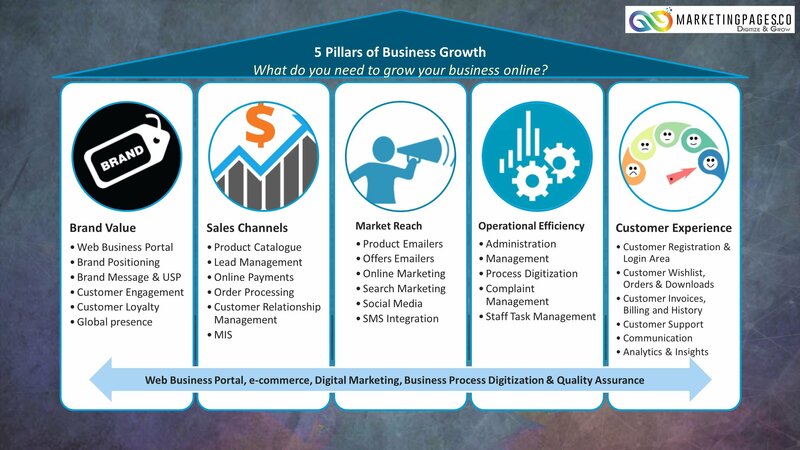 First of all, we have to follow the 5 Pillars growth business model as depicted in the below image, we have added necessary web components to each pillar to guide you, as to how you can implement this pillar in your business. The 5 pillars is a plan we believe is most noteworthy and can help any business to achieve their marketing goals. It thoroughly explains how to increase sales online in step by step and proper manner. Now the next set of question that pops in our minds is how do we achieve all this? Most of all important steps, we need to setup a state of art and very customer friendly web portal for business where we can conduct all business relevant operations. Remember, your web portal acts as your business representative even when you are away. Consequently, you end up increasing your reach for prospective customers. If we are selling any product or service, e-commerce should be allowed on the web portal allowing your customer to let you pay from his own comfort. Allow your customers to interact with you over using your business web portal, customer satisfaction should be the target. In addition to the 5 pillars, let us understand the key benefits in simple language the advantages of each pillar. Establishing Brand Value and why it is important? What is Brand precisely then? Your brand is your identity in your target market, how people think of your company. Why it’s needed – A good brand increases the value of a company, provides employees with direction and as a result makes acquiring new customer easier. Consequently, any brand is a perception of people towards your company, customer service, reputation, advertising and logo. Branding is the first important aspect of the answer to the question as to how to increase sales online. Gone are the days when only customers used to search the service or product provider. Now product or service providers equally need to be on the lookout for prospective customers. Business have to continuously market their products so that they are not forgotten or eaten up by competition. Use laser targeted ads on facebook or other social media to drive traffic to your sites. Records are maintained in an orderly and systematized manner. Improved efficiency leads to improved services and happier customers. Customer experience is of utmost importance for retention of a customer, as customers now have way too many choices, they can easily change the vendor. This is another key pillar which completes the answer to the question as to how to increase sales online. Happy and delighted customers tell their friends and family about your product as a result getting free and very effective word of mouth marketing. Successful and unsuccessful marketing or sales strategies can be easily identified based on analytics and customer feedback.